If you are currently in the midst of hay fever season and you're looking for immediate relief, you're on the right page. If you are interested in a longer-term approach to get rid of your hay-fever for good, see my companion post, How to get Rid of Hay Fever for Good. When you're in the throes of acute hay fever, the best quick fix is the one that works! In my experience, nothing works better than a good acute homeopathic remedy. By “good” I mean the remedy which is an accurate match for your particular hay-fever symptoms. Give one dose and watch for improvement. When improvement wears off, repeat the dose. Give no more than 6 doses on the first day and no more than 4 doses on subsequent days. This is because, if you overdose on any homeopathic remedy, you risk producing the symptoms that the remedy is capable of curing. For the same reason, you should not continue to give a remedy for days on end. If your remedy is an effective match for your symptoms, you should not need it for longer than a few days. Typically, if symptoms are very intense, you might give the first 2 doses a half hour apart and the 3rd dose one hour later. As you begin to respond to the remedy, the intervals between doses get longer. If you see no improvement after 3 doses, it most likely means that the remedy you have chosen is not the best match for your symptoms. See if you can identify a better-matching remedy or book in for a professional consultation. In this post I’m concentrating on a few of the most common remedies that you are likely to find easily in a health food shop. If you see a good match for your symptoms, you can safely treat yourself or your family. This is a remedy made from the onion. The nose will be the main focus in the hayfever that can be helped by Allium Cepa. You’ll have a profuse watery discharge which “runs like a tap” often burning the skin around the nose or leaving a red mark on the upper lip. There can be a lot of sneezing. Despite the profuse discharge, you can’t breathe through your nose because the lining is so inflamed and obstructed. Your eyes are likely to run too, but they’re not burning like your nose. Your throat may feel raw. All symptoms feel worse indoors and better in cold open air. Euphrasia is a remedy made from a plant with the common name Eyebright. It is the first remedy we think of for anything to do with the eyes. As you might expect, in the type of hayfever that benefits from Euphrasia, the eyes will feel worst, with extreme irritation, itching and burning. Your profuse watery discharge from the eyes stings and burns but your nasal discharge does not. Your eyes may be swollen. Again, there can be lots of sneezing. The euphrasia hay fever can be accompanied by a tickling cough which is worse during the day and better at night and you might even be coughing up phlegm. The Arsen Alb hay fever has some symptoms in common with Allium Cepa. Like Allium, your nose feels obstructed and the watery discharge is corrosive. You may have sores inside your nose. You may have burning pains in your nose, eyes and throat. There can also be lots of sneezing, especially first thing in the morning and the nose can tickle intensely. Unlike Allium, the Arsenicum hay fever feels better for warmth, better in a warm room and the sore throat feels better for warm drinks. This remedy has a yellow or watery discharge from both eyes and nose, but neither is corrosive or stinging. Your eyes will be very itchy in a Pulsatilla hay fever and will feel better for cold water. The lower lids can be swollen. The Pulsatilla picture can also include hay asthma with wheezing and cough which are worse at night and worse lying down. The typical Pulsatilla picture includes wanting company and feeling tearful. Gelsemium is more often thought of as a ‘flu remedy. It suits the kind of hay fever where you are listless and apathetic. A dizzy, drowsy, weak feeling makes it hard to function. The eyes are puffy, the lids are heavy and the face is flushed. You’ll be exhausted from all the sneezing and your nasal discharge feels like hot water flowing through your nose. Sensitivity and irritability are key notes of any condition that will be helped by Nux Vomica. If you need this remedy you are likely to be sensitive to light, your eyes sting and your nose is stuffed up. You may have an annoying itch inside your ears and in your eustachian tubes. While your face feels hot, the rest of you is chilly. Your patience is short and it may be all you can do to avoid losing your temper. Can't Find a Good Match? Don't worry if none of the above 6 remedies looks like a match for your hay fever symptoms. 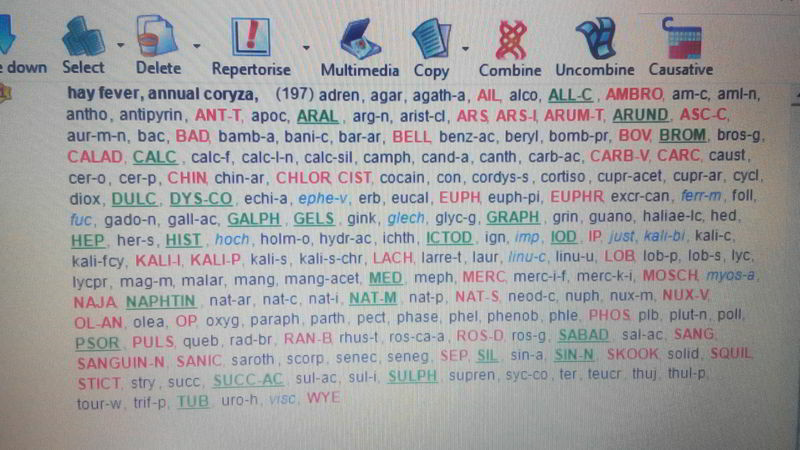 The screenshot below shows the symptom “hay-fever” in my professional computer programme. You’ll notice that 197 remedies are listed. This means that 197 remedies have the potential to treat hay-fever symptoms of various kinds. To tell you which of these 197 remedies might suit you best, I will ask you to describe all of your individual symptoms in detail. That's because each symptom has a number of remedies associated with it. After I take full details of your hay fever, I cross reference your symptoms on my computer to see which remedies are common to all. This will give me a short-list of possible remedies for you. Then I will ask you a few more questions so as to differentiate between them. Success depends on choosing the best matching remedy for you. If you'd like professional help for your hay fever, give me a call or send an email to arrange an appointment. Pollen count is highest in the early morning and late evening as well as on dry, windy days. It may be best to stay indoors at these times. Top places to avoid include woods and fields. When you come home after exposure to pollen, take a shower or at least wash your face. Don’t line-dry your clothes or bedding outdoors. Keep your house and car windows closed. Draw the curtains or blinds to keep the rooms you're not using cool. 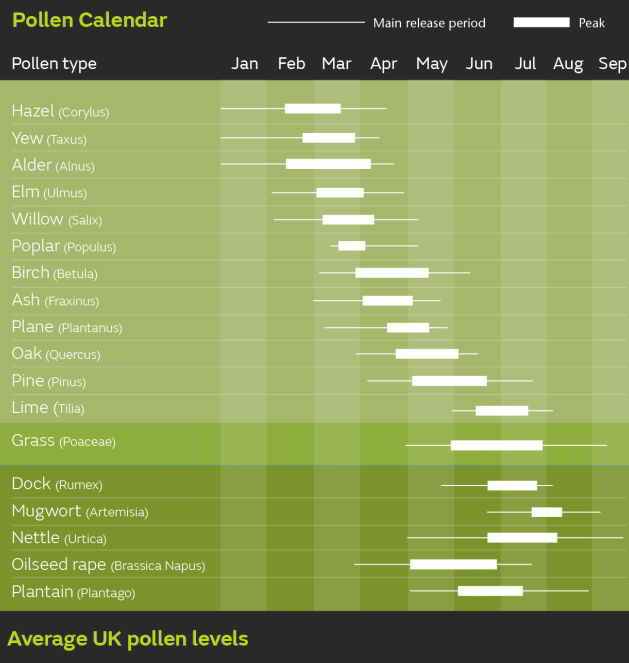 Check out the chart below, to see which type of pollen is a trigger for you. Then check the foods which may cross react and see if it helps to avoid them. Avoid alcohol, especially wine and beer, as these can increase hay fever symptoms. Vitamin C is a natural antihistamine. Bromelain (an enzyme from pineapple) is mucolytic. It is very effective in reducing sinus congestion. Echinacea, in herbal tincture, taken every 2 hours on high pollen days, can help greatly to boost the immune system, thereby reducing the severity of symptoms. Instead of trying to match your individual symptoms with a homeopathic remedy, you can treat the trigger, by taking an over-the-counter remedy called "Mixed Pollens". Some people find this helps a lot, to lessen symptoms during an attack but it won't prevent a re-occurence. Like to Get Rid of Hay fever for Good? Finding a remedy to get you over the hay fever season is only one part of the story. When you suffer from hay fever, it’s a sign that your immune system is out of balance. If you want to increase your resistance to pollens and other irritants you will need to go deeper than a quick-fix solution. Constitutional homeopathy aims to raise your level of health as a whole. My clients who have taken this approach have found that, over time, their hay fever has become milder and milder each year until it eventually disappears completely. Click here to read more about constitutional homeopathy for hay fever. To get rid of hay fever for good, I recommend that you continue with constitutional homeopathic treatment throughout the winter. You are not alone. It is estimated that 28% of the population suffers from hay-fever. 100 years ago, hay fever was very rare. Almost all seasonal allergies are caused by the pollen from trees, grasses, and weeds rather than pollen from flowers. The most common allergies in Ireland are to grasses and ragweed. The pollen they produce is small and can be carried long distances on a summer breeze, all the way to your nasal passages. Susceptible people produce an antibody called Immunoglobulin E. IgE sets off a chain reaction that results in the release of histamine, ultimately leading to sneezing, sniffling, and red, watery and itchy eyes. Alcohol worsens hay-fever. Beer, wine and other spirits contain histamine – the chemical that sets off allergy symptoms in the body. Pollen count is classified as Low, Moderate, High and Very High. The Irish met Office gives a 3 day pollen count forecast here. The UK met office gives a 5-day forecast here. Some hay fever sufferers experience itch and swelling along the inside of the mouth, lips and tongue when they eat certain foods, especially fruit and vegetables, during the pollen season. This is due to cross sensitivity of food proteins and some pollens. If you’re allergic to tree pollen you may also react to apple, hazelnut, carrot, cherry, kiwi fruit, nectarine, peach, apricot, plum, celery, soya and ﬁg. If you’re allergic to grass pollen you may react to oats, rye, wheat, raw tomato and legumes. Ragweed pollen allergy may trigger symptoms when eating banana, cucumber, melon, courgette, sunflower seeds, chamomile tea or echinacea. A house dust mite allergy is associated with allergy to shellfish and snails.